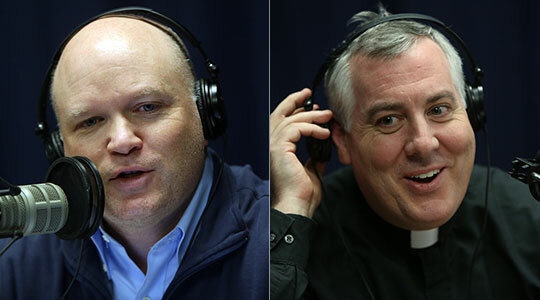 Summary of today’s show: On our last show before Christmas, Scot Landry and Fr. Mark O’Connell count down the top 10 Christmas hymns, according to Scot. Some on the list are expected, others are unexpected, and some cause a little good-humored arguments over the relative ranking of particular favorites. Also we hear the world premiere of Cardinal Seán’s Christmas message that will be played worldwide on Vatican Radio on Christmas Day. 1st segment: Scot Landry said this our last live show from the studio this calendar year and our last show before Christmas. Fr. Mark O’Connell said he is especially glad that the world didn’t end today. Scot said Cardinal Sean recorded a Christmas message that will be played worldwide on Vatican Radio. We hear the first broadcast today. Cardinal Seán referred to the starry night and the angels bringing the message of God to the shepherds. The shepherds went in haste to Jesus, Mary and Joseph and went forth giving praise and glory to God. He asked what if the people didn’t believe and didn’t share the news? But they did believe and we celebrate that the Word of God became Man among us. In too many ways the darkness threatens to overshadow us. The Light of Christ shines through the darkness and sustains us in our most difficult moment. We must share our faith with those around us. We must work to dispel the darkness and help one another live lives called to holiness. Fr. Mark said the message from Cardinal Seán is to share the faith especially in this Year of Faith. Scot said when we receive the Good News, our call is to take that Good News and share it with everybody. God allows us to participate in His plan for salvation. To whom much is given, much is expected. If we’ve been blessed with good Catholic formation, we are obligated to pass it on to others. On today’s show, we’re going to countdown the top 10 Christmas hymns as determined by Scot. Scot said other than the Gloria, there isn’t anything tremendously memorable about this song. Rick Heil said this is the song that separate the men from the boys in the choir because of the need for good breath control. Scot said Number 9 wasn’t one he’d heard as a child growing up in Lowell. He said it’s popular at the Archdiocesan Boy’s Choir School and among others and it’s recently become one of his favorites. Scot said it’s a beautiful poem set to a beautiful melody. Fr. Mark said it’s a song he’d forgotten about but he does love it. Number 8 is a classic Scot has heard most of his life. Scot loves the part in which they say “this, this is Christ the King.” Fr. Mark said it makes him recall the carolers coming to his house as he was growing up. Rick said when he was in a choir, it usually came later in the program because it was so contemplative. Scot thinks number 7 will be controversial because most will think it should be number 1. Scot said the only reason this is number 7 for him is because it always made him sleepy on Christmas Eve. Fr. Mark said it might have been played too much. He said he’s heard a nice version by Christina Aguilera when she was 11 years old. Rick said he used to sing it in German. He said it’s one of the first Christmas songs you learn, but learning to sing it in German gave him a newfound respect for it. And because it’s slower, he loves it. Fr. Mark says it should be higher on the list and the next song doesn’t beat it. Scot said that’s makes this fun. Scot thinks Number 6 could be some people’s number 1. He thinks every Catholic parish sings this next one on Christmas Day. Fr. Mark said it’s often sung at the end of Mass. People are joyful, all dressed up and greeting one another. It’s a great way to celebrate Christmas. Rick said it’s one of the songs that the congregation knows by heart and sings heartily. Scot said Number 5 wouldn’t have made his top 10 in the past week, but since then 4 people he respects have said this is their favorite Christmas hymn and it made him reconsider it. Scot said it’s one of the most beautiful harmonies he’s heard in church. Fr. Mark said it’s a beautiful song for a choir and so fun for them to sing. Rick said he agrees with Scot’s placement of the song on his list. Scot said there’s a lot of spiritual richness in the lyrics that are concrete and it all comes together in a way you may not expect. Fr. Mark said this was Number 3 on his list. Number 4 is one of Scot’s favorites to sing in church. This was his favorite performed by the Archdiocesan Boys Choir School, where his son goes. Veiled in flesh the God head see! Scot said there’s no doubt this could be Number 1. Fr. Mark said people could take this as a Christmas prayer and there’s so many profound thoughts in all of these songs. Scot said one of the things he loves about this is that people sing it loud. It’s something to participate in the Christmas Mass by amping up your volume to 10. Rick said this is another one of those congregation songs, that everyone sings, and it’s a good classic. He enjoyed it as a closing hymn. Scot said ranking the top 3 was tough for him. The next one was number 1 for a while. Scot said this has been the opening hymn for 33 of the past 35 years of Christmas he remembers. Fr. Mark said this is the first of this list that he sang to himself here because it’s so familiar. Scot said it’s an appropriate song for the entire year. We come to Mass every week to worship God and adore Him at that altar. Fr. Mark said because Mass is so full at Christmas, hearing this song at full volume tells you that this is Christmas. Now cutting to Fr. Mark’s Top 4. His Number 4 is different. It’s personal and it’s favorite because of the story connected to it. Fr. Mark said it’s number 4 because when he was a young teenager and his father was very sick in the hospital and there was a huge snowstorm at Christmas, they couldn’t have a tree. But the storm was so violent it knocked the top off their blue spruce tree which they brought into their house. The song symbolizes how Christ brings hope to those who are sad at Christmas. Scot said he’d never heard the song before. It would be wonderful as a Communion meditation. Fr. Mark said his number one matches Scot’s and Scot said Cardinal Seán agreed. He said his Number 2 is probably not in most people’s top 10. It’s also one of his favorite hymns of all time. Scot said he loves the lyrics and he said it rocks on the organ, the bigger the pipes the better. Fr. Mark said he would rank this one a lot lower on his list. Rick said it’s not a difficult song to sing, but it’s a very good reflective song. You can sing it to yourself and meditate on it. Scot said the theme of knowing God was taking on flesh that we should approach that mystery in silence with awe. And now Scot’s, Fr. Mark’s, Cardinal Seán’s favorite Christmas hymn. This version is the one recorded by Josh Groban. Fall on your knees, O hear the angels voices!